Safely store your flammable liquids, chemicals and paints away in your hazardous substance storage cabinet from VFM, and this extra shelf will help you to store even more. 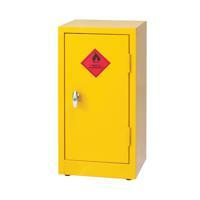 The bright yellow colour is indicative of dangerous substances and serves as a warning to all, while the shelf and cabinet are both designed especially for the safe and secure storage of hazardous substances according to COSHH regulations. The shelf is easily fitted and it adjustable.